Vampire Killing Kit for sale! Inspired by the True Blood series, this vampire killing kit for sale by legendary gothic artist CRYSTOBAL is a museum-quality display piece made with the finest detail and highest quality. Click Here to visit the True Blood Vampire Killing Kit Gallery on this site. Given to Adele (Sookie’s Gran) in her youth by her half-fairy lover, this kit was custom made for her protection against the growing number of “vampers” invading her home town of Bon Temps, Louisiana. 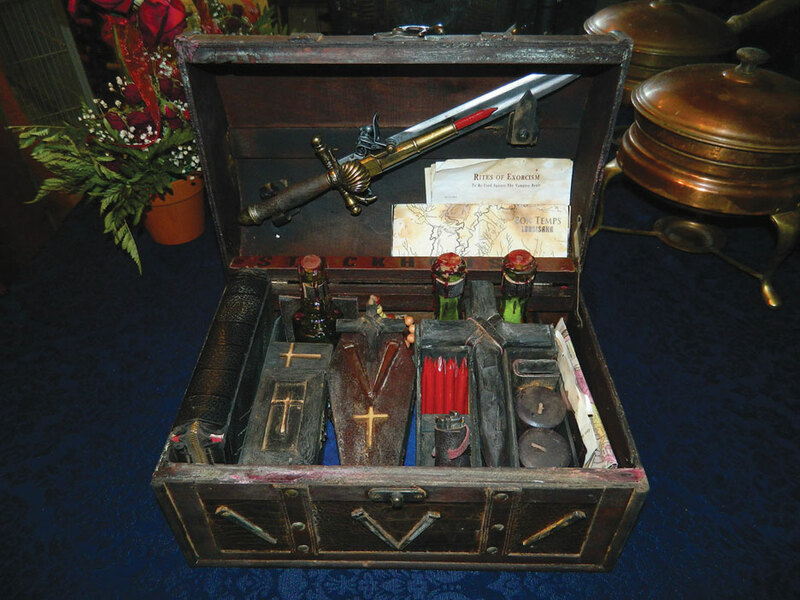 This is a LARGE size Vampire Killing Kit for sale, one of the most detailed ever created by the world’s authority on modern-primative vamp kits, the artist CRYSTOBAL. CRYSTOBAL began creating replica kits in the 1950s, and has blazed the trail for many copy-cats. ACCEPT NO IMITATIONS! This is a 100% real CRYSTOBAL Vampire Killing Kit, themed for the TRUE BLOOD book/TV series. It is a two-level kit, with the bulk of the accoutrements on top, plus a special compartment in the bottom for the hammer and letters. Size is 14″ x 9″ x 8″. • incredible 19th century combination flintlock pistol/dagger, custom-made to shoot wooden stakes directly into the vampire’s heart. • 10 hand-sharpened wooden stake projectiles. • Three hand-sharpened wooden cross-stakes, made in CRYSTOBAL’s original style with the leather bonding “X”. • Six vintage-style iron coffin nails in leather satchel. • One hand-made wooden hammer. • One 48″ length of heavy silver chain, known for being very effective against True Blood vampires, contained in an antiqued wooden box. • One antiqued coffin-shaped wooden box for holding fresh garlic. • One antiqued box for gunpowder, including a scope to add the powder to the pistol. • One vintage bible with zippered enclosure. • One hand-made wooden rosary with cross to match the cross stakes. • One antiqued mirror with leather cover. • One green glass bottle holy water. • One green glass bottle consecrated Earth. • One green glass bottle rock salt. • One Exorcism Prayer on aged paper. This kit was built at the end of the 1800s, commissioned by Fintan Brigant, the half-fairy who later has an affair with Adele (Sookie’s gran). He gives her the kit in 1937, for her protection against the worsening vampire threat in Bon Temps. Adele keeps the kit safe, and gives it to her son, Corbett, when she realizes that his life may be in danger (1979). This has been created to be one of the finest vampire killing kits for sale available anywhere in the world today. It is made entirely of new materials (except for the antique bible), and has been meticulously aged to look authentic to the late 19th century. Over 11 hours of work and more than $250 in materials went into this fully custom, one-off kit. CRYSTOBAL has never made another True Blood kit, and will never duplicate it. This is truly a one of a kind from the master himself. This vampire kit for sale will come with a certificate of authenticity signed by the artist himself. Click here to purchase this Vampire Killing Kit on Etsy – Paypal and credit cards accepted!